In Part I, we looked at the early organizing that took place in the fall of 2002, where various groups were organizing resistance to the possible US invasion of Iraq. In Part II, we talked about how some groups went to DC for a national march on MLK Day, but then President Bush came to Grand Rapids in late January 2003, where over 1,000 protestors greeted him. In Part III, we explored the organizing effort of the Grand Rapids chapter of Women in Black and the local news media’s reaction to the Colin Powell presentation at the UN on WMDs, in early February of 2003. In today’s post we want to look at what college students were doing to respond to a build up to the US invasion of Iraq, along with an action that took place against Congressman Vern Ehlers support for the US invasion that took place prior to the March 20, 2003 US assault on Iraq. Beginning in the fall of 2002, college students in the greater Grand Rapids area began to be involved with anti-war organizing efforts. Some of those students were part of the People’s Alliance for Justice & Change, but most of them were organizing on their campus. The above article from the Grand Rapids Press attempted to show that college students were becoming active, but the main problem with the article was that they were n’t really talking to students who were actively involved in resisting the US invasion of Iraq. 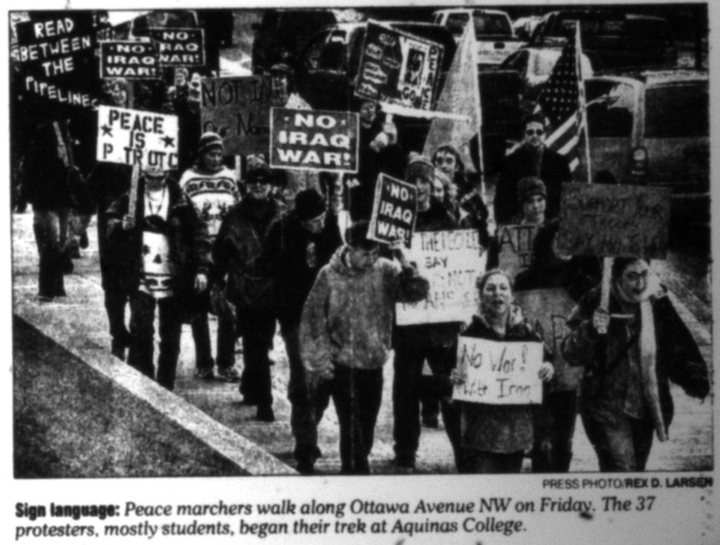 On March 1st, 2003, an estimated 50 people marched from Aquinas College to the federal building in downtown Grand Rapids to protest the looming war with Iraq. Students from GVSU, Calvin College and Aquinas College made up the bulk of those marching. The march numbers were small, mostly because the action began at noon on a Friday and went til about 4pm, which made it difficult for working class people to participate. 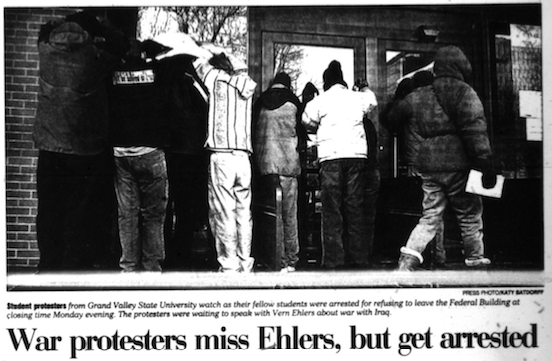 The GR Press article headline was misleading, since the group didn’t really care if Rep. Ehlers was there or not, they just wanted to make a statement about the impending US invasion of Iraq. There were a few GVSU students who participated in this action, along with members of the People’s Alliance for Justice & Change. Six people were arrested when they refused to leave the federal building, so the US Federal Marshals called the GRPD. 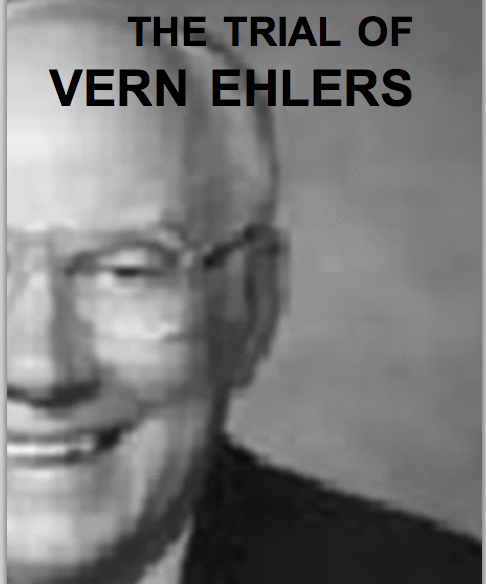 The group had people there to speak to the news media and to hand out two flyers, one with information about the illegality of the US war/sanctions on Iraq and another handout, which was a poster of a WANTED sign for Rep. Ehlers, which called for his immediate arrest for supporting war crimes. A few months later, the People’s Alliance for Justice & Change organized a People’s Trial against Congressman Ehlers, with a subpoena issued and the trial proceedings video taped. In Part V, we will look at organizing to support the Arab American community and Muslims in Grand Rapids and the final action that took place before the US began bombing Iraq on March 20, 2003. This entry was posted in Anti-War/Anti-Imperialism and tagged anti-Iraq war organizing in Grand Rapids, anti-war protest against Rep. Ehlers, student organizing against the Iraq war. Bookmark the permalink.